riders and thrilling rides. Tears of joy or just the wind in your face, leave other rides in the dust as you ride thru the neighborhood. Very SatisfiedWe bought 2 of these 3 years ago and have been very happy with how they have performed and held up. The batteries continue to work as expected. The only improvement we’d like is the ability to swap out seat for a more traditional bicycle seat. Other than that, we are very please with our purchase. (BTW, these are used by 2, 45+ year olds and a 9 year old. Good Scooter, I am very happy with this purchase!Bought this for my 13 year old brother in law as a birthday gift and he loved it he rode all around the park. 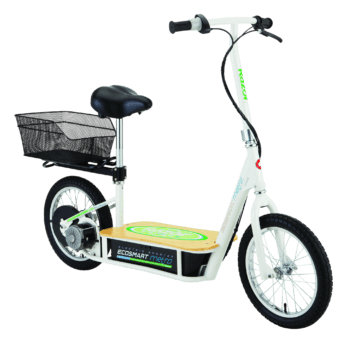 The best part of this is it come with seat.The seat is pretty comfortable and I also do like the big rubber tires it helps with stability and helps with a smoother ride.